Thank you very much for your care, your prayers and financial support which kept our mission on the air for another month. We thank God for your generous help! We have exciting news! It looks as though construction will begin on the new transmitter building about May 15th. As May began, an 8-foot snowdrift still covered where the western end of the shed will sit. Along the eastern edge lay a foot-deep melting goo of sand and drilling mud from the piling work in early winter. Our work is cut out for us! As you'll read, the news is not all good. We have several expenses which will be far higher than expected. Please pitch in with these extra needs if you can, won't you? May God richly bless you. It may not look like much, but the first break in the ocean ice brings promise that winter may finally be giving way. 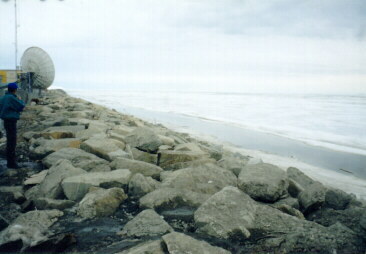 1997's melt began early, and great leads had opened in the ice by May 1st. Incidentally, the immense 30-foot satellite dish in the left background is the AT&T communications center along Nome's seawall that provides most of the telephone and other communications in and out of our isolated arctic community. In some remote villages, violence is believed to occur in as many as half of the homes. This horrible problem is intergenerational: violence is often produced by people who were once themselves victims of violence. Solutions are long-term and difficult, but experts agree that education is the key first step. As part of KNOM's continuing efforts to bring peace into all homes, the first days of May we devoted about seven hours of air time to a live conference assembled in Nome to address the problem. This gave thousands of village families front-row seats, and vital knowledge into the root causes and the first steps toward solutions. We thank you for making genuinely live-saving broadcasts like this possible over KNOM. Inspirational Spot: I will make the Lord my music. I will make His Love the Key, which tunes my heart to His and gives my life its harmony. 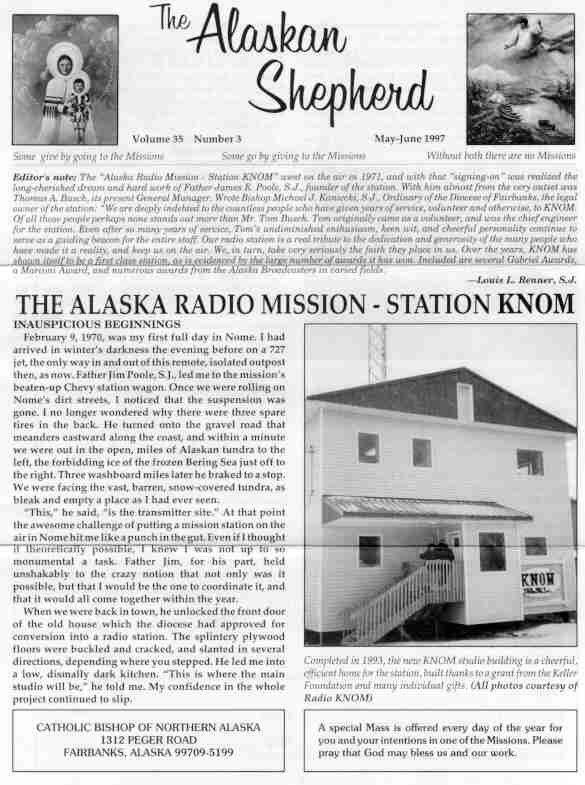 Top of page If you receive "The Alaskan Shepherd" from the Catholic Bishop of Northern alaska, you've already seen the bishop's May-June issue, written by KNOM manager Tom Busch about some of the problems of the early days, successes and problems suffered by the KNOM mission over the years. Catholic Bishop of Northern Alaska is the legal name for the Diocese of Fairbanks, which is KNOM's owner. The diocese reviews and approves KNOM's operation, our budget and special projects, and for years, funded about 8% of KNOM's needs. That subsidy ended last July, when the diocese required we fundraise entirely on our own. Thanks to you, we've been doing that and holding our own. If you'd like to receive a copy of this issue of the "Alaskan Shepherd," please drop us a line and we'll be happy to send you one. Do good to yourself by doing good to others. SPECIAL NEEDS: It seems as though we are always begging for help. With the unexpected increase in several transmitter project items, we have several needs which find themselves suddenly "orphaned." We've shopped for good prices, but these needs are all "on hold." Can you help? Do you know someone who can help? MICROPHONES: These are the very basis of broadcasting. Not a single one of our interview mikes is younger than 27 years old, and two have failed in the past year. The remaining two are beginning to sound bad. Four AKG 3800 microphones: $572. EMERGENCY TWO-WAY COMMUNICATIONS: These are transmitter/receivers which provide emergency communications to our remote transmitter site and our truck. They are absolutely essential, especially during the winter. Our existing system uses a failing 1975 transmitter and a 1974 receiver. The second unit, once at the transmitter, failed long ago. The unit in the truck is vintage 1982. Three Kenwood TK860K transceivers, microphones, and a diplexer at the base station, which will allow us to use an existing antenna on our 80-foot studio tower. Total emergency communications: $2,972. MICROWAVE LINK: This transmits all of KNOM's signal and control circuits from the studio out to the remote transmitter. The existing unit is 18 years old and is failing. Marti STL-10/950 transmitter and receiver: $3,134. UHF MASS RECEIVER: This 1979 unit, which we use to pick up our Sunday Mass broadcasts, is failing intermittently and must be replaced. Marti CR10-2D: $1,258. Inspirational Spot: Jesus, fill us with Your most Holy Spirit and release His Life and Power in our lives, that He may teach us, lead us and work through us, bringing the fruits of Your Presence, Peace and Joy to us and to those around us. As God's child I can confidently say "Thank You!" 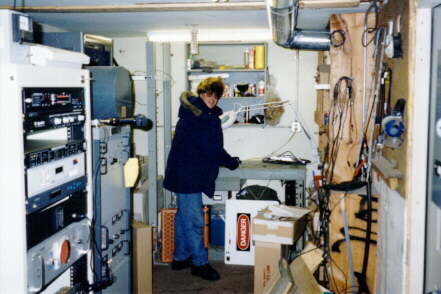 KNOM general manager and engineer Tom Busch solders a connection inside the 1960's highway shed that continued to serve, one last winter, as transmitter building for KNOM. Thanks to the generosity of thousands of our friends, it is being replaced this summer. Thank you. The old place is rough, and we're ready for the new one! 25,000 WATT UPDATE: There is mixed news this month. We've increased the size of the building slightly, to 16 by 24 feet. The extra few feet add very little cost, but might be appreciated by future KNOM workers. By May 15th we'll shovel away the drifts which still blanket where the western half of the building will sit. Meanwhile, tons of drilling mud from the installation of the wooden pilings will have to be removed. It's like foot-thick quicksand. We'd hoped to save money and shovel it by hand but there's too much of it, and Randy will hire a small bucket loader and dump truck for an hour. The bad news: First is the Antenna Tuning Unit, which passes the transmitter's signal into the big antenna. When Kintronics, Inc. examined our tower specifications, they recommended higher-voltage components than they had earlier planned. This added $9,000 to the expected cost. The antenna tuning unit, before shipping to Nome is $14,456. By the way, Kintronics is the nation's most highly respected firm working in this field. Second, when Randy Pomeranz calculated his actual cost for the electric wiring for the building, he was shocked to find it much higher than he had anticipated. Including all wiring, an emergency heater, two cooling blowers and the emergency transfer switch to pop the building over to the standby generator, the electrical cost is expected to be a horrifying $12,000. Still, the wiring will be done safely and properly, with the intention of providing KNOM's new transmitter a well-constructed and trouble-free permanent home. Third, the Nome power company is requiring us to pay the freight for the four heavy pole transformers from the Lower 48 (Three plus one spare). We don't have a freight figure, but expect this extra cost will be between $2,000 and $3,000. Please help if you can with these unexpected needs. If you can't help, please pray that someone who has the ability will be inspired to do so, won't you? thank you! Inspirational Spot: Lord, help us to willingly unite our daily sufferings with Your suffering on the cross, that we may someday better share in Your Joy. 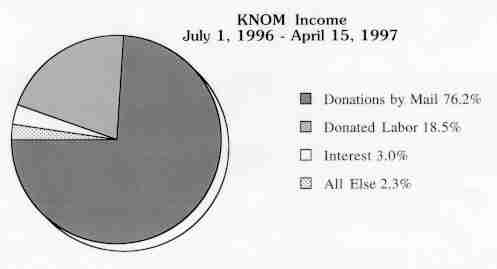 Now that KNOM's funding is completely independent of the Diocese of Fairbanks, several of our benefactors have asked for pie charts of our income and expenses, like the ones we've been providing you at the end of each calendar year. From the income chart, you can immediately see how vital your contributions are to the mission! To a lesser extent, KNOM is made possible by its workers, who are paid less than they would receive in comparable jobs elsewhere. This contribution totals about $145,000 a year. Any time, feel free to write KNOM with any questions, or if you'd like a detailed financial statement. 25 YEARS AGO was a typical, heavy snow year. The May 1972 "Nome Static," notes that the snow was finally melting down to around waist level. On the air for less than a year, KNOM was about to receive its first inspection by the Federal Communications Commission. AROUND THE REGION: In late April, the grizzly bears began to grumble out of hibernation, many seen just north of Nome....with the early ice breakup, dozens of Eskimo hunting parties were making their way in small boats around the shifting ice floes in the dangerous age-old quest for subsistence food, primarily seals, from the arctic ice pack. Please join us in praying for everyone's safety. Inspirational Spot: Love is like the five loaves and two fishes. It doesn't start to multiply until you give it away! INTERNET: You can e-mail KNOM general manager Tom Busch at tbusch@knom.org, program director Ric Schmidt at rschmidt@knom.org, and our news department at news@knom.org.